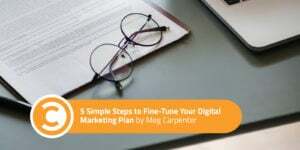 Creating an effective digital marketing plan can be difficult. Fortunately, this five-step guide includes working templates, checklists, and real-life examples to make your planning a little easier. It identifies brainstorming best practices, where to find customer insights that have real value, how to write your vision and mission statements, SWOT analysis, and how to find SMART goals. This article covers the main points, but if you can go straight to the full-length version if you prefer: 5 Steps to Planning a Winning Marketing Strategy. Your company will struggle if you don’t have a strong marketing plan that delivers the right products and services to the right audience, and resonates with prospective customers with meaningful messages. Ensures your objectives are aligned with those of your company. Defines objectives, tasks, and timelines. Helps persuade the finance department. You have to be brutally honest. You’ll need discipline, time, and focus. Be prepared to admit your weaknesses and recognize your strengths, competitive advantage, and target market. Is it necessary? Whether you’re starting from scratch or updating last year’s plan, you need to prove you’ve done your research, understand your target market, and are clear as to what the competition is doing. How much will it cost? You’ll need clear and concise figures. Who are we targeting? Whether you’re targeting your existing customer base or reaching out to a new segment, demonstrate how you’ll target your audience. How are you going to measure results? Identify how you plan to track metrics such as newsletter subscribers, open rates, click through, time spent on website and bounce rate, email subscribers, etc. Don’t get lost in details—your boss is looking for the bottom line. Demonstrate how you dealt with the priorities for the year. What was the ROI? Were results good, targets met, and goals achieved? Or did your plan totally miss the mark? If you don’t review what you did, how will you know what worked and what didn’t? Without this information, you’re working blind. Perform SWOT analysis to find your strengths and weaknesses. What are your competitors up to? Check out your customer base. Did it shift? Having analyzed last year’s results—what worked and what didn’t, SWOT analysis completed, competition stalked, customer base confirmed—you’re now ready to start coming up with ideas for your new marketing plan. It’s time for identifying and solving problems, generating new ideas, instigating cross-functional communication, finding your competitive advantage, and innovation. Who needs to be in the brainstorming room? Anyone involved with maintaining and implementing your marketing strategy. Include your content writers, community managers, market operations, graphic designers, demand generation, email campaign officers, UX designers, SEO and SEM specialists—anyone who’s going to be playing a part, however small. Check out the best practices in the guide and remember, nothing kills the energy in a brainstorm quicker than calling an idea stupid—it’s a really cheap way to prove your own superiority. In your company, there are teams that talk to customers every day, including sales, support, and account managers. Talk to them. Feedback from these teams gives you customer insights that you may have missed, direct from the frontline. Your aim is to maximize profit and sustainability, which means you’ll need to bring the six P’s into play: product, price, people, promotion, place, and positioning. You’ve completed your brainstorming, generated lots of exciting new ideas, and solved issues. Customer-facing teams have shared invaluable customer insights. You’ve established your Vision and Mission statements. Now it’s time to set your goals. The first step to planning a marketing strategy that’s going to work is to be SMART. Specific: Real numbers with real deadlines; who, what, where, why? Go crazy with data and insights. Make sure your short-term goals support your long-term goals. Never assume you know what your customers want. Social media listening can fill in the gaps, so you know what they’re saying, asking for, and complaining about. Don’t ignore your competition—it’s certainly not ignoring you. Be wary of growing too quickly. Never become complacent about your product. Analyze last year’s marketing strategy and prove ROI. Establish strategy, outlining your objectives versus results. Perform quantitative versus qualitative analysis to prove what worked and what didn’t. Well and truly stalk that competition. Write and share your vision statement with the team. Set your (very smart) SMART goals. Once you’ve completed your marketing strategy, be ready to present it to your boss. Break it down month by month, and demonstrate what your team is going to do and how it’s going to be achieved. To be brutally honest, SWOT to be SMART! Download 5 Steps to Planning a Winning Marketing Strategy for Next Year, for heaps more information.